Meeting at Hampden Christian School, 1234 West 36th Street, just west of Falls Road. 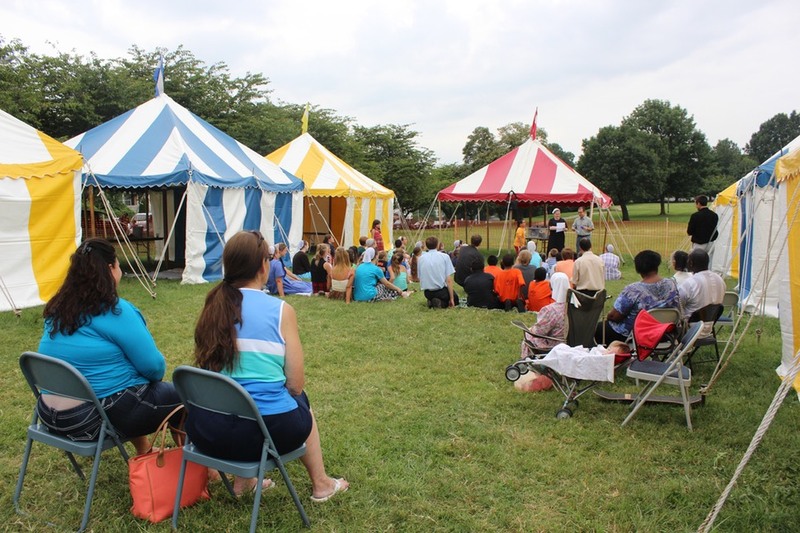 Hampden Mennonite Church held its first Vacation Bible School (VBS) in a park located half a block from Hampden Christian School every evening from July 28 through August 1, 2014. Eleven ladies and two men, as well as Arlin, Linda, and Rosalyn Horst, joined us Monday morning for an orientation under some shade trees at the park. 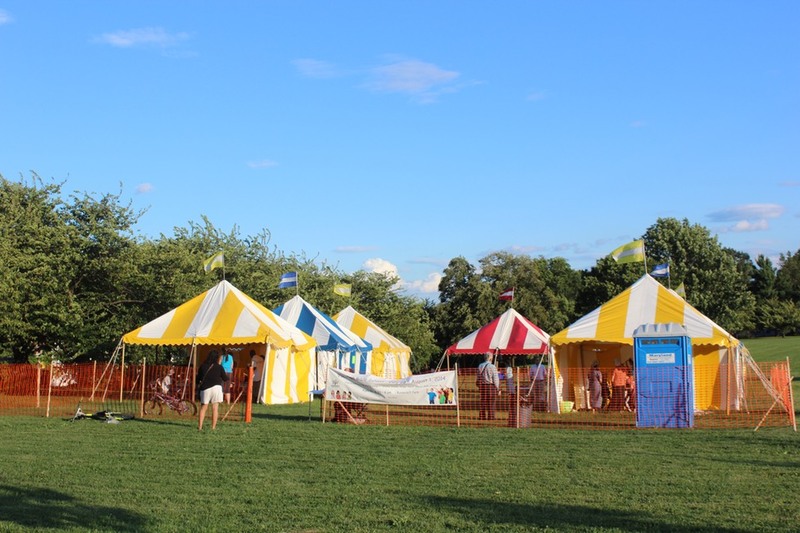 Although a traffic incident 75 miles away introduced a delay, we eventually were able to erect seven colorful tents and surround them with an orange temporary fence. Our pastor, Nathan Zook, arranged cultural and service experiences for the visiting teachers during the day, including a day spent serving a meal to homeless people, and another assisting with a renovation project at Hampden Christian School. 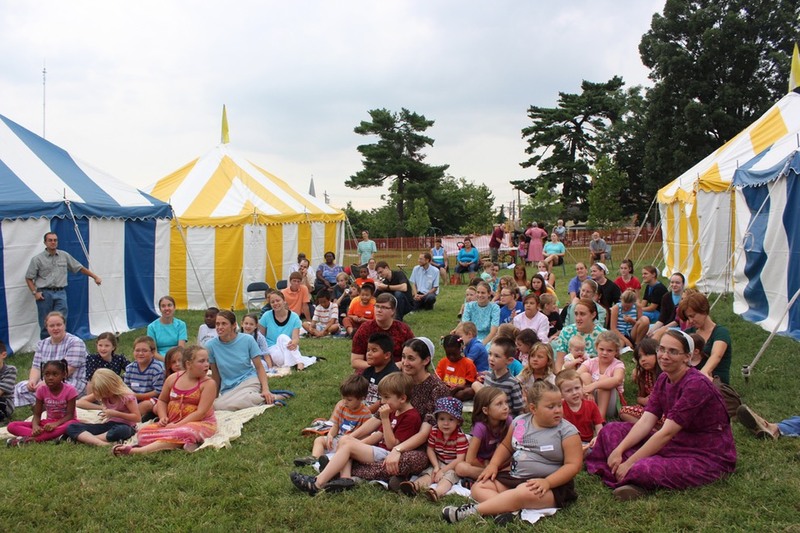 The many hours that our local staff put into preparations were rewarded when between 44 and 52 children attended VBS in the evenings, for a total of approximately 75 children served. We praised the Lord along with two young ladies who responded to call of the Holy Spirit after hearing the testimony of a teacher whose life was transformed by the Gospel. Please pray for these young ladies as they face the temptations most of us have never faced, that their lives can witness to their family members and school friends. One of our teachers has been meeting with them regularly in a friendship/discipleship relationship. We have also begun a follow-up relationship with some of the children we met at VBS. Ten children from Kindergarten up through age 12, including four from the community, joined us at HCS the evening of September 8 for singing, a skit, a short time in class, and an ice cream snack. We look forward to the continuing opportunity to invest ourselves in these children’s lives. As you think about what God is doing here in Baltimore, please pray that God would be glorified and that the lives of the children of our neighborhood will never be the same. This page was last updated July 30, 2018.